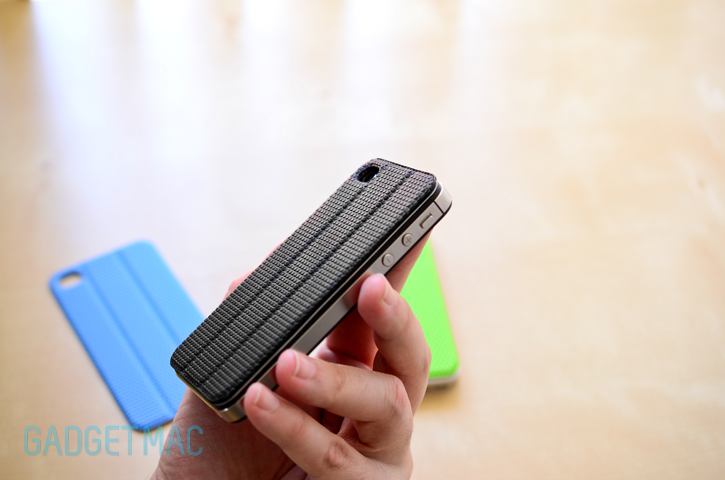 You wanted a Smart Cover for your iPhone too? 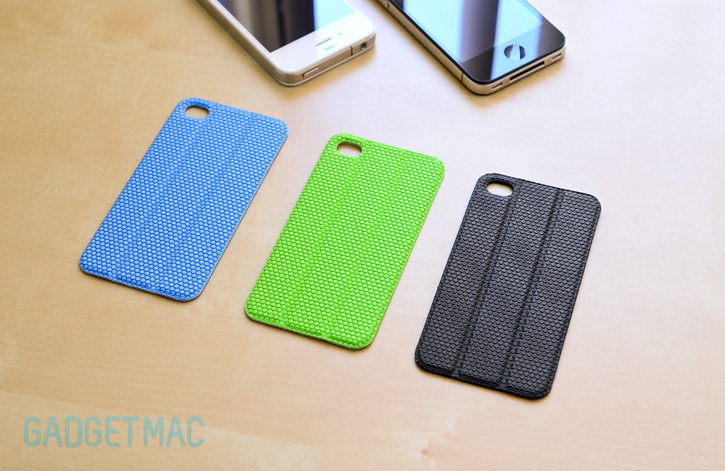 This is the next best thing to an iPhone Smart Cover that we've come across. 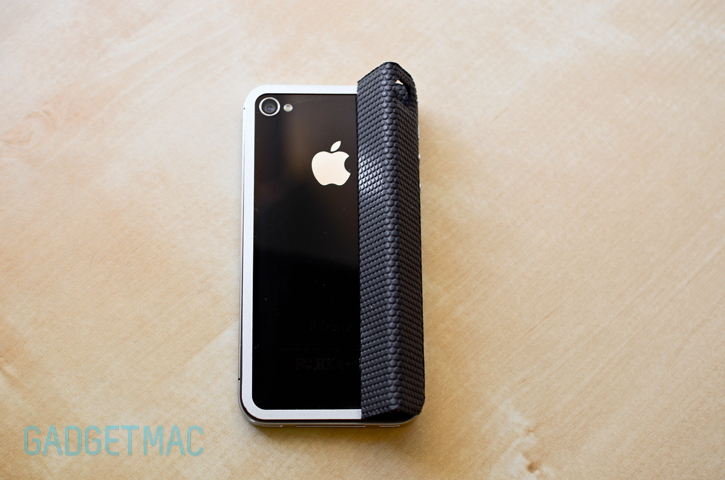 A rear facing smart cover for the iPhone 4S and iPhone 4? You better believe it. 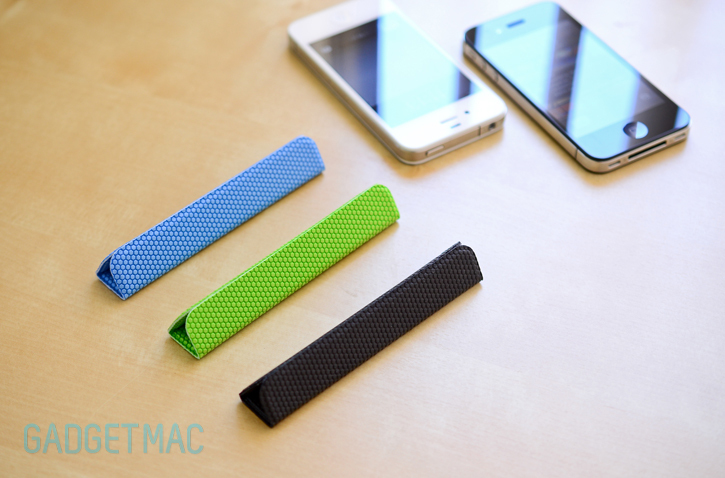 Back when we featured TidyTilt when it was only a Kickstarter project and now a successful one, the jam packed accessory had a lot to offer in a very familiar design. TidyTilt has a striking resemblance to Apple's magical iPad Smart Cover, and not only does it kind of functions the same way, but TidyTilt also serves as an in-ear headphone cord organizer as well as a magnetic mount. 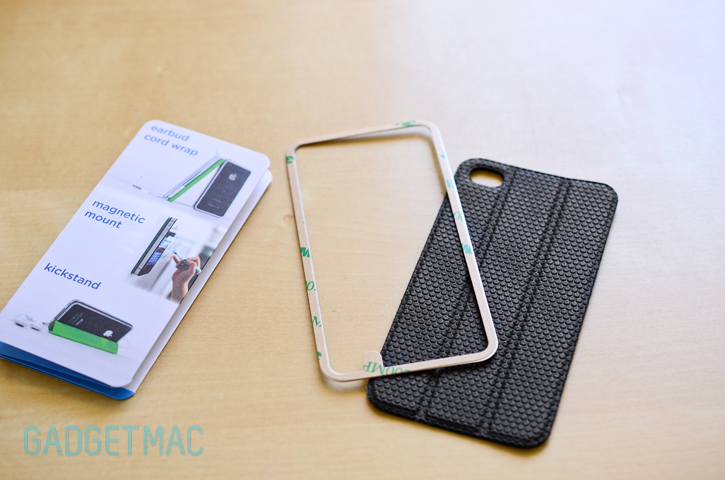 Thrice the magic that of an iPad Smart Cover. Catch the full review past the break! TidyTilt is priced no more than your usual case at $30. It comes in black, green, pink and blue colors as of this review. In order for the TidyTilt to mimic how a Smart Cover works and compensate for the lack of integrated magnets in the iPhone 4S and iPhone 4, a thin magnetic metal frame with a residue-free adhesive sticks to the back of the iPhone and auto-aligns the TidyTilt cover with its embedded magnets into its place while keeping it securely attached to the iPhone at all times. I can't say that I liked the idea of having to attach a metal frame to the back of my iPhone's glass, but it turned out that it wasn't any worse than using a thick skin. The adhesive works wonders and can be easily removed and applied a few times until the frame cannot be used anymore due to it's somewhat fragile, thin form bending from each removal. Overall, the installation was a piece of cake with clear instructions included. The metal frame itself isn't magnetized and is thin, but slightly noticeable when holding the iPhone without the TidyTilt rear cover attached. You shouldn't find yourself not holding your iPhone without the cover on in the first place. But should you decide to go solo, the metal frame is quite comfortable to be left on while it too adds a level of scratch protection when placed on a table. The silver color of the frame compliments the black and white iPhones rather well I might add. Though I would have liked to see a black frame option available in addition. Just like that, TidyTilt rolls and folds into a triangle shaped kickstand of awesomeness. The embedded magnets inside the cover cling together and form a solid and reliable magnetic bond that even sounds like a Smart Cover closing together. While the cover has a camera cutout, you will not be able to use the LED flash unless you fold the cover to the side. Unfortunately, the rear cover does not self-align with the metal frame so you'll spend those extra 1-2 seconds making sure all is perfectly centered with the back facing camera. What's TidyTilt? Think of it as the iPhone's best friend. Always clinged to its back and ready to be rolled into that ever so famous triangle shape when the time comes to prop the iPhone at a perfect landscape viewing angle, or the perfect low angle for a more hands-on, typing experience. And instead of protecting the iPhone's screen, it resides around the back keeping the most vulnerable area constantly protected against scratches, scuffs and even as far as glass breakage. I'm no one who likes to use portable or desk stands for the iPhone, but in the time that I've been using the TidyTilt with my iPhone I'm really liking the level of protection it offers when not using a case as well as the quick and effortless stand capabilities when at a coffee shop or at home. There are so many great uses for the TidyTilt, it's such a versatile little accessory that it boasts an all-in-one moniker. 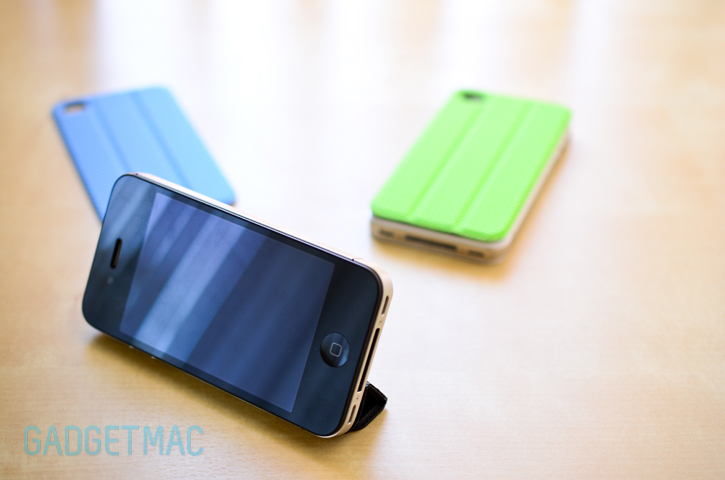 After you've folded up the rear cover to the side to form a kickstand, you can then position your iPhone in either a landscape viewing orientation, best for watching videos and displaying clock apps at your bedside table, or choose to lay your iPhone at a steeper angle best for typing and fully interacting with the touchscreen. Both angles are steady enough that when using the touchscreen your iPhone won't tilt backwards nor will the magnetic cling detach on you just like an iPad Smart Cover. I have not run into any issues of the cover shifting from its position while I kept my iPhone in my pants pocket whatsoever. I've gone as far as using tight jeans, all without much of a hassle. 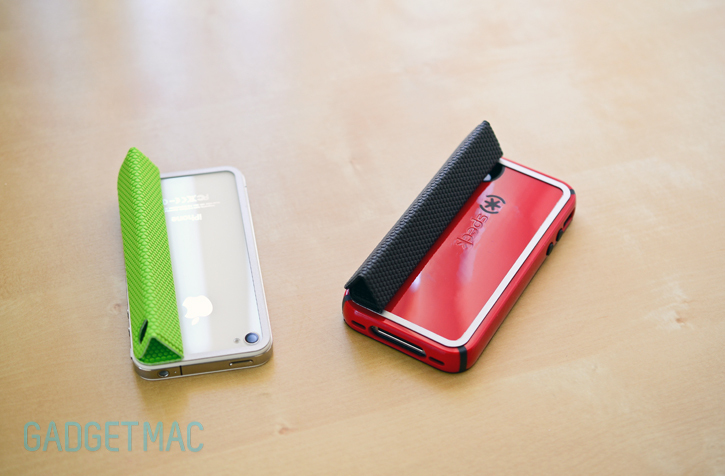 The magnets are strong enough however, to interfere with the iPhone's compass. Otherwise they're completely harmless to your iPhone. So a fair bit of warning there is to detach the cover while using the compass. TidyTilt sits flush behind the iPhone with very little bulk added. 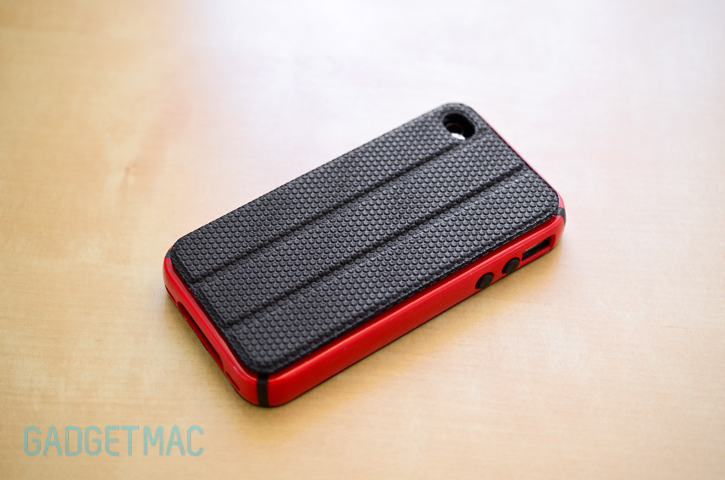 If you're used to not using cases, this isn't going to drive you nuts and will only add additional grip and protection while retaining a slim profile. What about case compatibility? I found TidyTilt to be even more versatile when I could keep on using my favorite protective cases like this Speck CandyShell case without ever having to remove it and still enjoy the great Smart Cover-like benefits. It almost looks like these two were designed to be used together as one. Although TidyTilt's metal adhesive frame has been designed to work on the iPhone's glass, TidyTilt will work just fine with virtually any hard plastic cases with a smooth flat back. 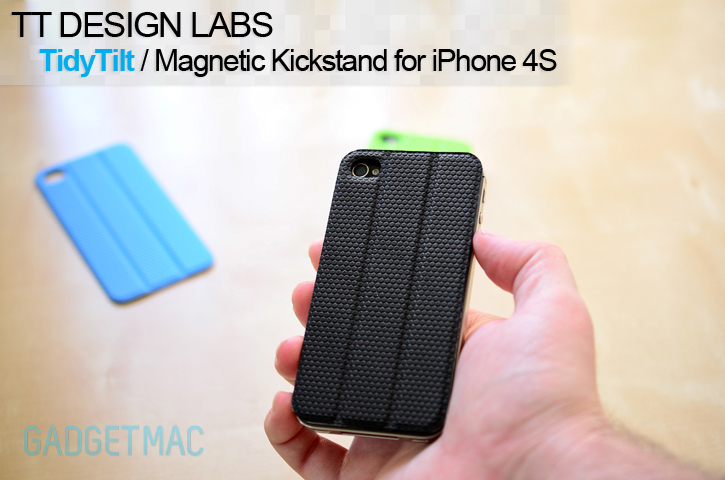 The magnets are strong enough to keep it together even with the additional weight of a case like the CandyShell. Because you can completely detach the cover from the back of your iPhone, TidyTilt can always help you wrap your in-ear headphones in a more organizes fashion when folded into itself. I never bothered using the TidyTilt this way since I think using the storage case included with your in-ears is a better option. 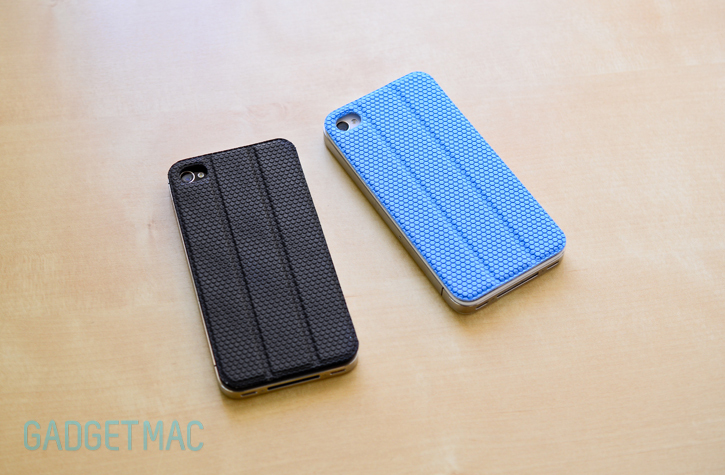 The folks at TT Design Labs decided to add this micro hexagon pattern which can be seen on both sides of the TidyTilt cover instead of going for the clean, more basic Smart Cover-esque style. Design wise, I think this pattern looks best with the black color more than the rest. The cover itself is made from polyurethane, the same material used for Apple's Smart Cover, however the TidyTilt cover is a lot grippier and feels softer to the touch. Even though the TidyTilt's material is a lot more grippy and rubbery feeling than Apple's polyurethane Smart Cover, it attracts no lint whatsoever. TidyTilt works exactly as advertised, and I couldn't be any more pleased with it covering my iPhone's back. 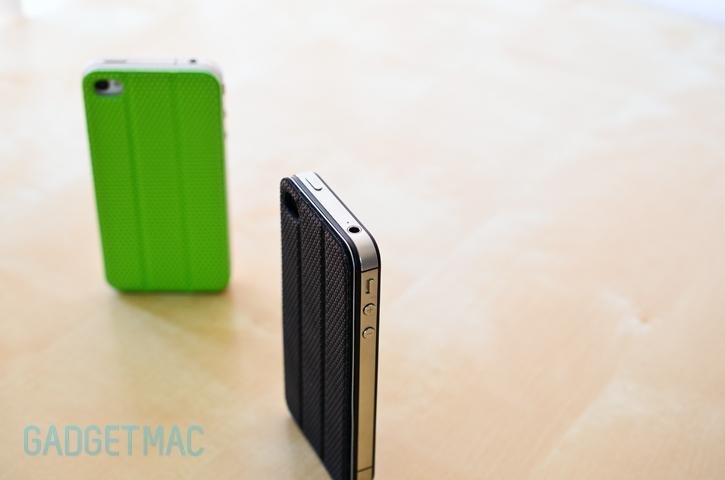 We could have waiting for as long as who knows for Apple to release an accessory like the Smart Cover for its iPhone. 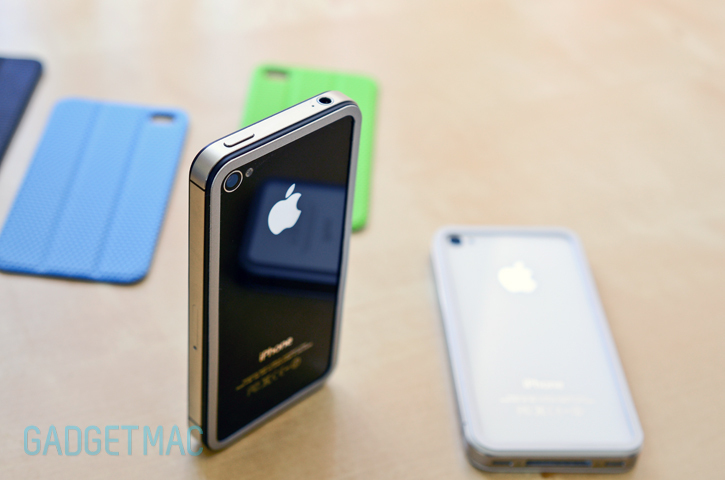 This actually serves as the lost magnetic multi-use iPhone cover Apple never made. In fact, TidyTilt works so well it has exceeded my expectations. TidyTilt is a cute, accurate name. 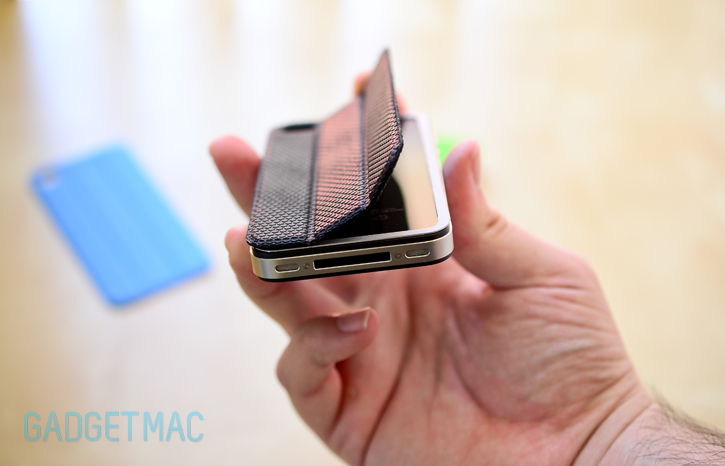 But I'm calling this a rear Smart Cover for the iPhone just because that is what it feels like when you're using it. 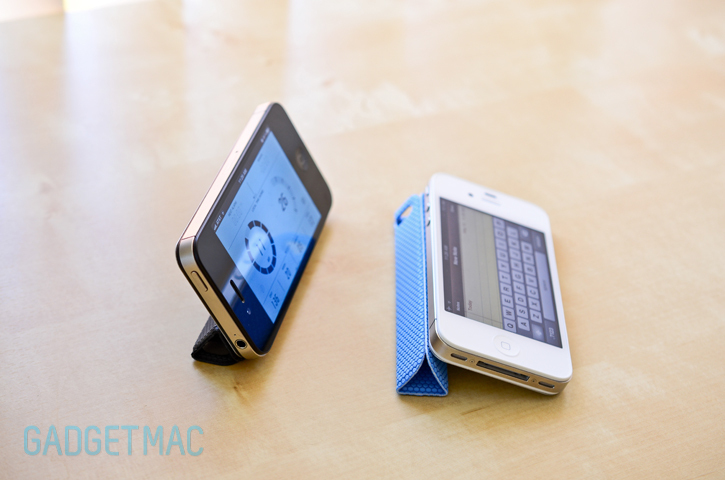 If TidyTilt isn't a smart cover for the iPhone, I don't know what is. TidyTilt is a great buy if you're looking for an accessory that will not only keep your iPhone's backside protected with additional grip, but will serve as neat viewing kickstand when the need is indeed. Especially iPad users who love using their Smart Cover.